This book contains a large catalogue of maladies with suggested acupuncture points to produce health and healing of the condition. 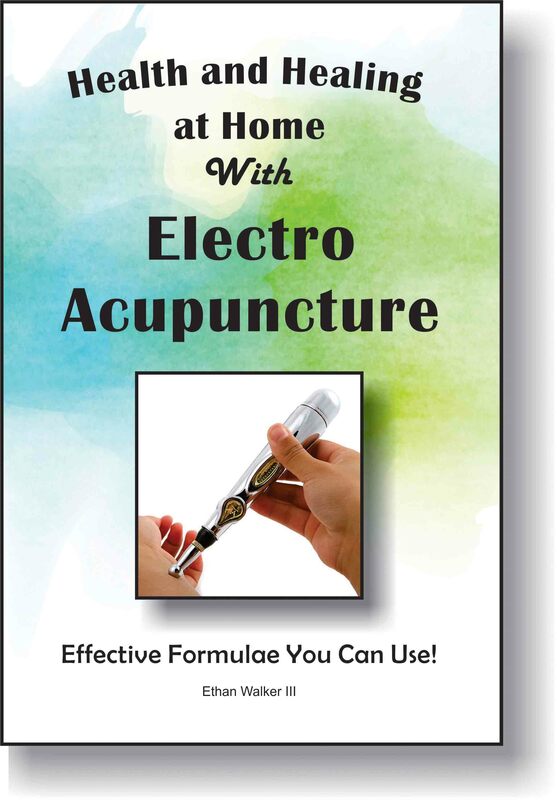 They can be treated at home by one's self with a simple, inexpensive electro acupuncture device. The points come with detailed descriptions for finding them as well as drawings showing where the points are located on the body (see sample page). This makes the book very easy to use for someone with no knowledge of acupuncture points. Also included is a thorough discussion of electro acupuncture devices and where to buy them. They range from $10 to $160 with the $10 unit being the device that is most often used by the author! Acupuncture is a method of treating diseases and ailments that confound the human body. The system dates back thousands of years and closely corresponds to East Indian healing philosophy. While Indians did not develop the method of stimulating various points by needling, they described the system of energy pathways that circulate through the body. The energy or life force that circulates through the body (and also through all of Nature) is called Chi or Qi (pronounced “chee”) by Chinese practitioners and Prana in ayurvedic Indian medical literature. In the late 1800s, Nikolai Tesla discovered a new form of energy which he called radiant energy. It behaved more like a gas and would pass easily through metal. He believed this newly discovered energy to be what Indian yogis called Prana (therefore the same as Chi). Dr. Wilhelm Reich discovered and experimented with this energy in the 1950s which he called Orgone and he developed Orgone accumulators which one could sit in to increase health. He also performed many other experiments with this energy before he was arrested and jailed for saying he could cure cancer. He died mysteriously toward the end of his two-year incarceration. The body has specific pathways through which the chi travels and circulates and these are called meridians. In Indian ayurvedic medicine and yogic science these pathways are called nadis. Each meridian is related to and corresponds to a group of or+gans. The flow of chi through these meridians can become, weak, stagnant, blocked or overly energetic causing an imbalance. Health is then described as a harmonious balance between the meridians, organs and the dynamic flow of chi. Here we enter the Chinese concept of Yin and Yang which describes the complimentary polarity that exists in all things and without which the universe could not exist. For example, we have dark and light, soft and hard, inner and outer, gain and loss, cold and hot, male and female, summer and winter, rest and movement and so on. A practitioner of traditional Chinese medicine (TCM) can diagnose these imbalances by feeling the pulses in the wrists (there are 9 different pulses in each wrist for a total of 18 different data points). This is also found in the practice of East Indian ayurvedic medicine. This is quite an art and science and requires practice and training to master. Other techniques of diagnosis are used such as examining the color and consistency of the tongue. The idea here is that everything in the body is connected and therefore everything is simultaneously affecting everything else. In fact, this is not only true for the body but true for the entire universe. To render a treatment, the acupuncturist inserts a thin needle at prescribed points on the body. These points were mapped thousands of years ago and it is faith-giving to now discover with our modern equipment that the skin resistance to electricity is much lower at these prescribed points. How did these ancient Chinese know how to find these points? Yet they most certainly did as proven by our ability to now detect skin resistance. The citizens of USA are the most medicated people on the planet. For example, Americans consume 80% of all the pain killers manufactured worldwide. Another astonishing fact is that the University of Toronto conducted a statistical study of hospital deaths in the USA and found that pharmaceutical drugs caused over 2 million hospitalized persons to suffer a serious negative drug reaction in a one-year period of time. Over 100,000 of these people died! It was revealed that 75 percent of these were due to the toxicity of the drug and not due to an allergic reaction. This study did not include death caused by mistaken drug overdoses or mistakes in giving the drugs. Had these been tallied, it is estimated that an additional 100,000 annual deaths would have to be included. The researchers at the University of Toronto concluded that death by prescription drugs in hospitals is the 4th leading cause of death in the USA after heart attacks, cancer and strokes. How many more deaths do prescription drugs cause each year outside of the hospital that are never reported? These facts are very disturbing. In many cases, acupuncture will be a solid, viable alternative to prescription drugs and it is the opinion of the author that the pharmaceutical companies will do everything possible to suppress this truth. Not too many years ago the American Medical Association was found guilty of slandering and oppressing chiropractors. In doing research for this book, the author is stunned to discover literally thousands of clinical double-blind studies which clearly demonstrate the positive healing power of acupuncture. One can do a search for the word “acupuncture” on the website of the US National Library of Medicine which is maintained by the National Institutes of Health and see over 15,000 clinical studies on acupuncture for most every affliction and disease known to man.